Tech evangelist and all-round good egg Stephen Fry was caught in a very public spat recently when his anger at a Twitter post almost made him quit the micro-blogging website. Interesting, then, that before this upset took place, Fry spoke to T3 about all things Twitter and offered the gadget magazine some sage tweeting advice. Speaking after he was awarded with T3's Gadget Personality of the Year, Fry pointed out the perils of twittering about your life day in and day out, saying: "Stop before you tweet is of course the wisest thing. I've tweeted things and immediately wished to un-tweet them." He then went on to explain that less haste is the key to not making a fool of yourself on the site, something he seemingly forgot about when confronting Twitter user @brumplum about calling his tweets boring: "You can [un-tweet] of course, but because of all the followers, if only 2 per cent have seen it that's still thousands of people.They've then retweeded it and it's out there, so I try not to be too hasty." Fry's Twitter-gate incident has caused a number of celebrities to remark about public forums like Twitter, with comedian David Schneider writing in the Guardian today that: "Every YouTube clip you're in, every blog or article that's posted online leaves space for comments. And Web 2.0 is not shy about telling you what it thinks. Unfortunately for some of us, the Ego 2.0 upgrades haven't quite come in yet." 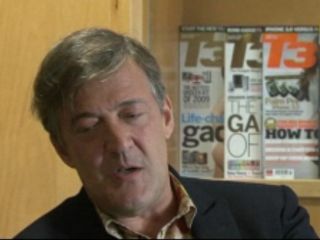 If you want to see Stephen Fry's exclusive video interview with T3 in full then point your browser to www.t3.com.